I am currently building my engine with Gabe. I am adding a catch can system and want to run -AN fittings. I chose -10AN fittings and took the parts to JE import performance to have the bungs welded on. Found out the valve covers are magnesium. 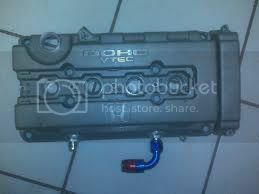 Do any 1mz's come with aluminum valve covers so I can add a AN catch can system. Otherwise I will need to buy another catch can as the one I bought comes pre installed with AN fittings. Gabe, said he has never added AN fittings to those covers before and didn't know they were magnesium. I didn't know either so any help would be greatly appreciated. Can't the valve cover be tapped and the fitting threaded in? ^thats what i would assume. Are you flippin smoking crack laced with dusted wrapped in hemp? Cause thats the only excuse I'll accept as to this thread. ASG14 wrote: Are you flippin smoking crack laced with dusted wrapped in hemp? Cause thats the only excuse I'll accept as to this thread. It was something I was considering but since its is taking Gabe longer than expected to sell the supercharger and some other parts to get my build going full steam, my mind tends to wander and explore new avenues for the community. This was not expected and I was looking for a trick setup for the car, but since the valve covers are magnesium it did not work. I wasn't looking for all the hate but this is the real reason why I don't use this site anymore. Too much hate when some one has other ideas that have never been done before. Thanks everyone! No hate here man we're just saying you can use your time and money in better ways. We all wish you the best for your build and personally I'm very interested to see how it comes up. Just the other day Gabe was telling me a little about what he has in store for you. People on any forum can be subject to ridicule. That's normal. Since the catch can idea didn't make sense with AN fittings I bought one just with the standard barb so I can still use a catch can.